The New York Post reports that after almost a century of history, New York’s Roseland Ballroom will close in April with a run of seven shows by Lady Gaga. Initially, Roseland was located at 51st Street and Broadway when it opened in 1919. During that period, the 3,200-capacity room was a hot spot for jazz and big-band music. The likes of Glenn Miller, Benny Goodman and Frank Sinatra headlined there multiple times, and ballroom dancing was also a big draw. Roseland moved to its current 52nd Street location in 1956 and, at first, maintained its reputation for ballroom dancing — as well as being used for ice-skating and operating as a roller rink. But in the late 1970s and early 1980s, Roseland caught up with the times and started to host disco club nights and shows by modern rock, pop, dance and hip-hop acts (everyone from Red Hot Chili Peppers to the Rolling Stones to, last week, Lorde). 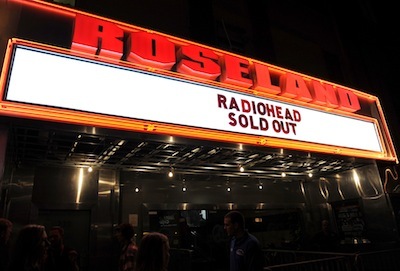 The sadness around Roseland Ballroom’s demise — five years short of its centennial, no less — is compounded by confusion. Owner Larry Ginsberg hasn’t made a public statement about what will happen to the site. Meanwhile, music-industry rumors vary from the building being demolished to make way for condos to an all-new Roseland opening in the future. Whatever happens, the venue has already written itself into New York folklore. ITS a shame so many landmark building,s torn down to build condos. roseland, was agreat place to catch a show. No more, so that the homo hipsters can live in the city!!!!!! I agree Tito. New York keeps tearing down its antiquities. At one point, they were thinking of getting rid of the Customs House in Bowling Green. If you haven’t seen the building, Google it, it’s stunning. They rip down buildings with history and beautiful architecture to erect modern glass boxes. Too bad this city doesn’t take a cue from Boston and Chicago where they honor and preserve their history.